The Inn at Huntingfield Creek offers communal full country breakfasts every morning at 8:30 in the Main House. The menu always includes fresh orange and other seasonal juice, a generous selection of local fresh fruits, farm fresh eggs, two varieties of premium breakfast meats, a delicious sweet (changes daily), LeBus sourdough toast, gourmet coffee, and deluxe teas. Gluten free or allergies? Just let us know and we can accommodate! Treat your tastebuds and start planning your delicious stay at the Inn at Huntingfield Creek! 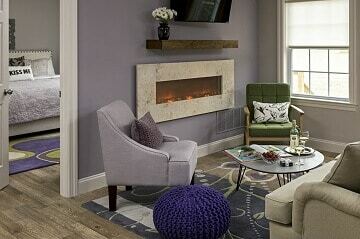 Take a peek at our beautiful Eastern Shore accommodations. Pour over bread and allow to sit 15. min. In a small saucepan melt 1 stick butter and add 3/4 c. brown sugar, boil until fully incorporated. Pour evenly over bread and fruit. Bake at 410° for 40-45 minutes until puffed and bubbling. Enjoy complimentary premium wine, beer, and soft drinks as well as homemade salted chocolate chip cookies in our library. “Everything grows at the Inn at Huntingfield Creek. Even you will! There are flowers everywhere and herb gardens and wood flowers on the way to the creek. 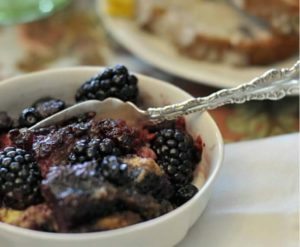 My favorite from the good earth of the Inn at Huntingfield Creek is the blackberries that grow in innkeeper Joanne Rich’s garden.